Lords of Blood: Six Converted Bloodthirsters! Angron's Bodyguard, the Cruor Praetoria, is now taking shape, with my 6 smaller Bloodthirsters all built. As you can see, they are all designed to be roughly the same size as the classic Bloodthirster in the middle. In game terms I can run them as normal Bloodthirsters (of Unfettered Fury) or as Daemon Princes - this will be particularly good for Codex: Khorne Daemonkin, if the rumours that some of the formations need non-Bloodthirster HQs are true, and as it seems like Daemon Princes can carry the cool artefacts that Bloodthirsters can't. As you can probably tell, these Bloodthirsters have been made from 6 basic kits (Juggernaught, Balrog, Bloodthirster, Forgefiend, Hive Tyrant, Daemon Prince), but hopefully mixed up enough and with enough extra pieces from my bits box added that by the end they are a coherent set of 6 Bloodthirsters. Hopefully! The Lord of the Rings Balrog is an excellent Bloodthirster stand-in. He's bigger than the classic model, comes with a wonderful whip (which I trimmed the flames off very easily), and just fits so well! I opted to give him a headswap for a Juggernaught, giving him a more bestial, bull-like appearance. I also up-armoured him, with bits from Daemon Princes, Hive Tyrants, and WFB Marauder shields. 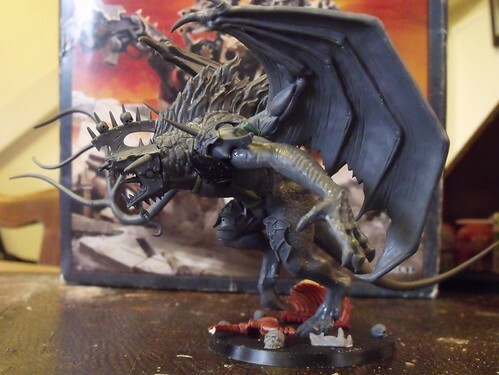 Finally I swapped his lovely big wings for some smaller Daemon Prince wings - I want to use his wings for some larger Bloodthirster projects! As soon as I saw the WFB Morghasts I knew that I wanted to use their wings for a counts-as-Skarbrand, they're just perfect. Possibly they're a touch small, but they're so beautifully made. 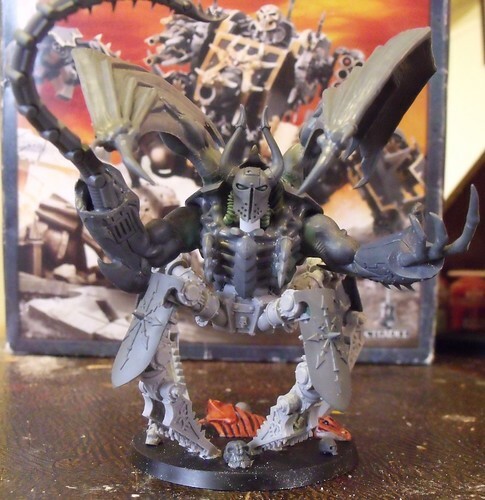 Skarbrand's body is a Juggernaught, his legs are from a Hive Tyrant, and his brutal twin cleavers are from the Morghast Harbingers (with Daemon Prince arms & shoulder pads). Finally his head is from the Balrog, with some green stuff tentacles for dreadlocks. I love my green stuff tentacle maker so much, it's changed everything! This Bloodthirster is my weediest, apart from the classic. He'll probably be relegated to being a Daemon Prince more often than not. His wings are the old metal ones from a Chaos Dwarf Lammasu, whilst his torso and shoulder pads are from a Daemon Prince. 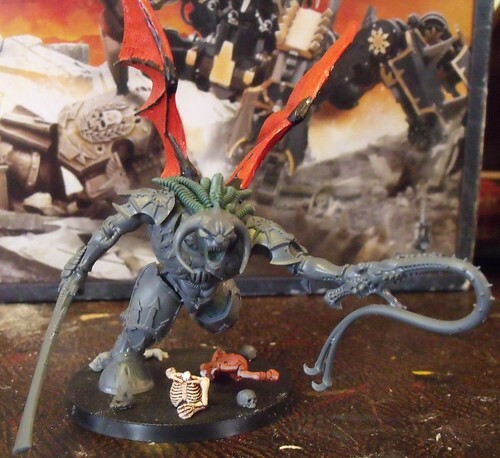 His legs are the marvellous Forgefiend back legs again, and his arms are from the very useful Hive Tyrant. 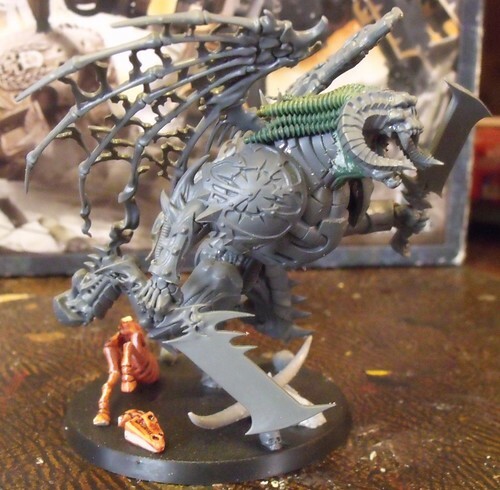 This final Bloodthirster is the most unique, thanks to his Blood Slaughterer legs. The idea is that he is an overseer of the Brass Forge, working for Khorne to create his Daemon Engines. His Hive Tyrant torso ties into this, with overlapping armour that evokes the Blood Slaughterer, Juggernaughts, and Brass Scorpions. 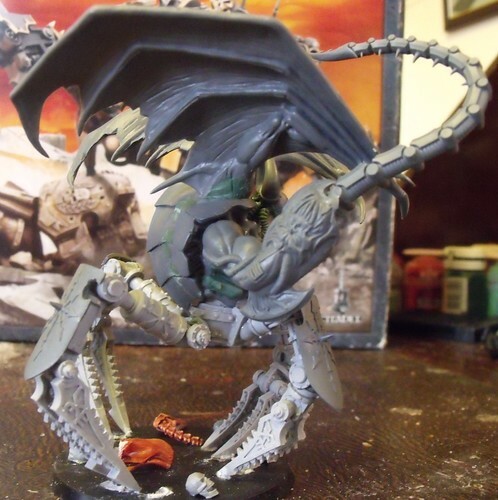 His arms and wings, of course, are from the Daemon Prince again.